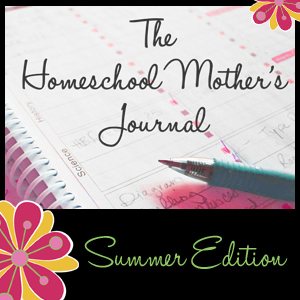 This week revolved around homeschooling and the bathroom with a lot of cleaning thrown in. Ian’s Birthday Party is on Saturday. His actual birthday was back in January but we are just getting around to the party. However that means at least 4 friends from preschool and their moms in my house. It is now presentable and the living room is almost looking like the photos that I see on the minimalist Babycenter board. 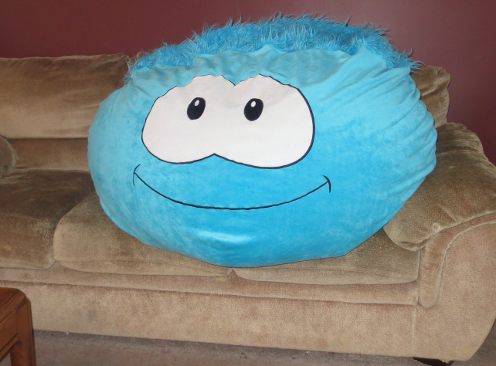 I had giant Bouncer on the couch while we cleaned the homeschooling room. The bathroom is coming along great and I should have a second working toilet by sometime on Monday. The tile work is done. We have painting and installing the toilet and vanity. The vanity is arriving in a week but the counter top isn’t for two weeks. As long as I have another toilet I will survive. This week’s challenge on the minimalist board was kid’s rooms. 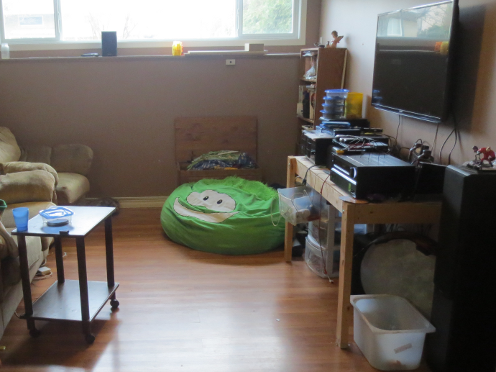 Given that all my kids share a room it is rather cluttered but most of that is clothing, books and stuffies. The stuffies are off limits at this time and I need my wife’s help with the clothing so I decided to organize and purge books. Most will go to the thrift store. 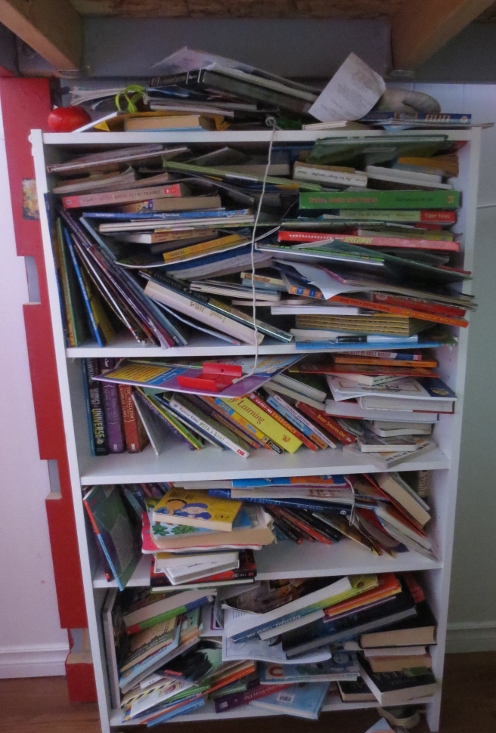 So I got rid of one box of books. With the party coming up I need to get the upstairs clean as it was neglected last weekend with the downstairs mass cleaning. It wasn’t bad as we have been better at keeping it clean. It also meant that we went farther in our cleaning. That is good since two of the guests have infant siblings and we have not been baby proof in years. 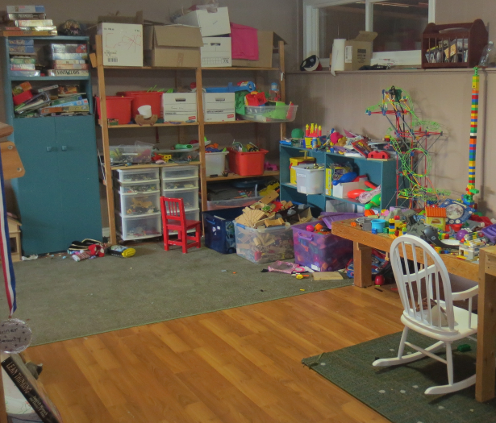 Since I have talked to a number of the moms about our homeschooling I couldn’t just shut the door to the room so we did some heavy cleaning in there. 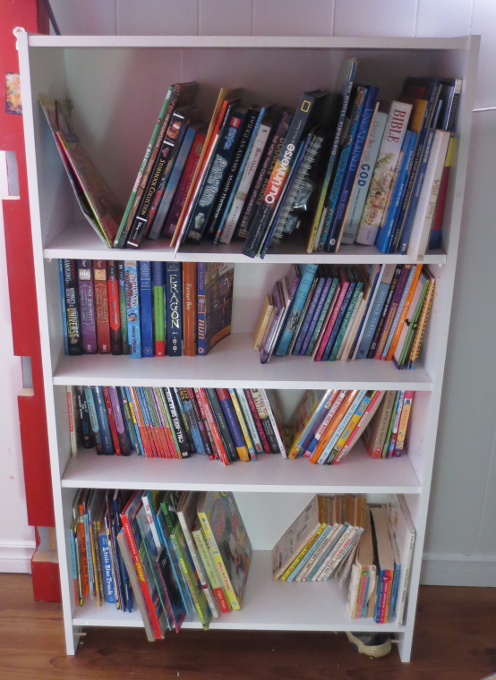 My wife sorted the book shelf and although I didn’t take any photos she did to it what I did to the one in the kids room. She also eliminated some of our old used curriculum. So we eliminated two recycling bins worth of stuff. The cool thing that we did this week was make a battery out of some pennies, lemon juice and paper towels. You have to use post 1982 American pennies and the pennies do not survive the experiment. There was some discussion on website as to whether this was legal. From what I read it was but also I’m in Canada. You do not get a lot of power out of this. The picture shows it lighting an LED. I hooked it up to a volt meter and got between .01 and .02 volts. 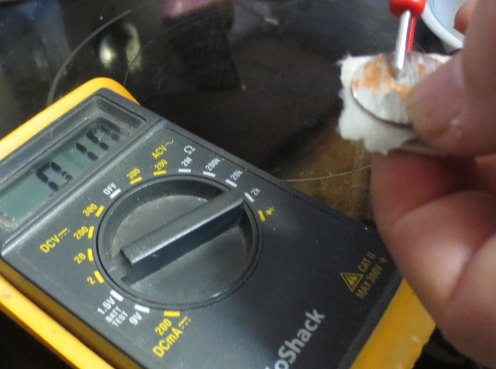 The system is dependent on the amount of lemon juice so as it dries out it loses power. Margaret spent a lot of time reading about the native residential schools that were here in Canada. It is some tough reading. The book she had touched on it lightly but it was a sanitized version of history. That led to us having a discussion of what sanitized meant in this case. We then read some web pages that showed the real horrors of some of these places. We got some good notes. Next we need to organize them in to an outline. Margaret also got to start an eight week art class. The first day they spent learning some sketching skills. Later they will do some watercolor and some acrylic paintings. The ability to sketch something is so fundamental that I am glad that she is learning how to do. The week started off with an event put on by my wife’s work. She works for a creative company with lots of very talented people. So this was an evening for all those people to show off their talents. It was an amazing production. There was a live show featuring a wide variety of musical acts along with some humor, dance and other talents. Out in the lobby there were other artists including paintings, sculpture, pottery and a fellow that makes his own swords and other medieval weaponry. His “Do Not Touch” sign also had the warning that they were sharp. There was also a Lego contest where they were give a box of Lego that must be used, a limit of 100 additional piece and whatever other items. 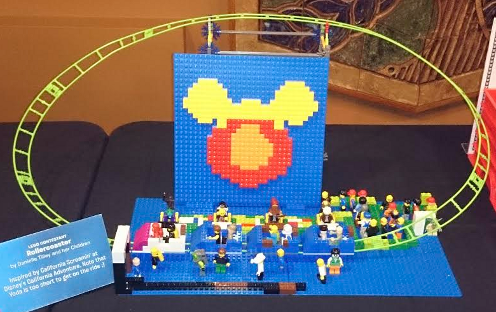 My wife and kids made the roller coaster from California Adventures. The roller coaster part was K’Nex and they had a huge line of mini figures waiting to get on except poor Yoda who was too short. We won one of the three prizes and received some company merchandise. The bathroom is coming along. A lot of little detail things happened this week but culminated in the tiling of the tub enclosure. There is going to be a border going around the edge and the top. We spent all day Saturday cleaning and doing yard work. Grandpa volunteers at a house for recovering addicts and brought some to help with the yard work. 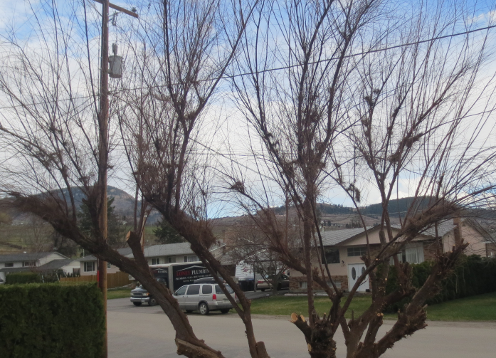 The yard looks as good as when we moved in and the tree in the front yard has had a severe but needed haircut. The kids and I tackled the basement. This was an absolute disaster ie it was difficult to walk a straight line anywhere. We made lots of progress but this is going to be a long term project. At least now we have room to work. We got 2 bags of garbage, a bin of recycling and finally got rid of our old TV. I needed the help of one of the guys. I can lift it but with my arms stretched out I didn’t fit up the stairs. I also took all our DVD’s out of their case, most were already out, and recycled the cases. I guess that makes one more bag. With access and the knowledge that I have a truck coming on the weekend I wanted to get all the large stuff out. That consisted of Margaret’s old dresser. You know it is not of good construction when you are able to tear it apart with your bare hands. 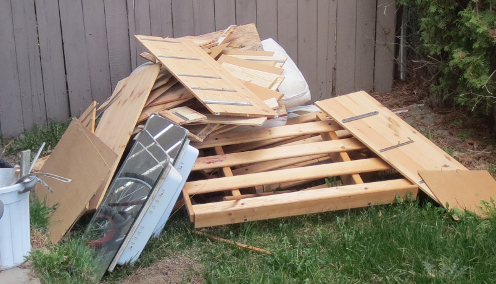 It is in the growing pile for the truck to take to the dump. Also gone is an old office chair that was hiding in the storeroom. The more open basement let me see some easy items to get rid of specifically an old computer, VCR, receiver, PVR and modem. Shelly the snail got more expensive. My wife decided that glass bowl wasn’t working and that she needed an actual aquarium with aerator and filter. I think she was right. She had stopped moving and that is a sign of a stressed snail. My wife did some research online and discovered that a lot of what the pet store told us wasn’t correct. We have corrected all the issues and she has been moving around well. We decided to pass on adding a second snail when we learned that they breed like rabbits and quickly over populate. I am not willing to deal with that so only one snail. Philip is just about finished with the snap circuits. He has been recording each circuit and explaining how they work. Next week we will make a penny battery and a potato one. Both kids have been reading poetry, specifically the works of Henry Wadsworth Longfellow and the The Song of Hiawatha. I remember that from my youth but now I am trying to remember if it was from school or my mother. My wife and daughter are in an Irish band. 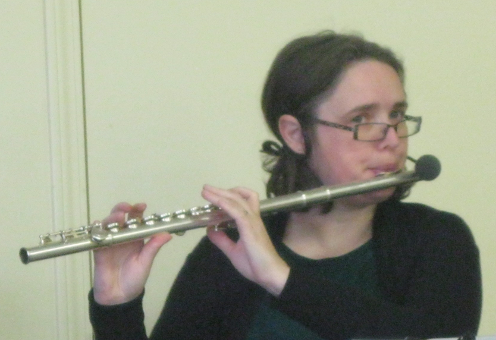 Margaret sings and my wife plays the flute. So they have had events to go to all week. Philip who does Irish Dance, dances at few of the same events. Life has been busy. Two events we always do. The first is a Tea at our old church. It is nice to go back and visit with everyone. The second is the Irish Society Dinner. A steak dinner is always high on my list. Especially when it comes with a fully loaded baked potato. 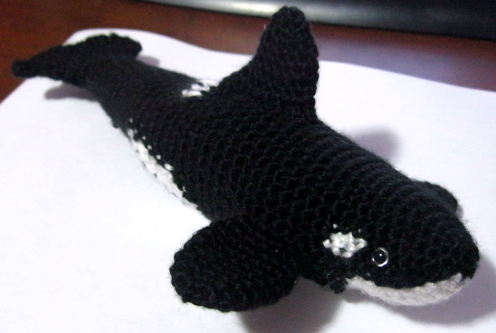 My wife finished crocheting an Orca whale for Ian. 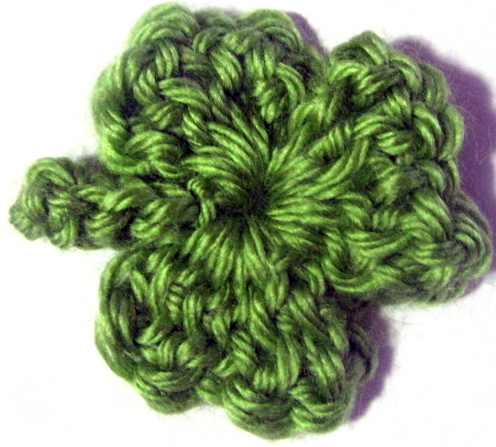 She also taught Margaret to make these Shamrocks for St Patrick’s Day. I started cleaning one of the worst closets in our house. 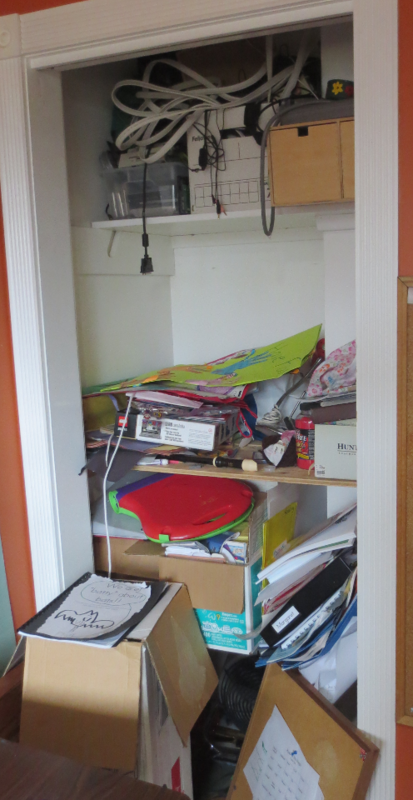 This used to be the homeschool room but before that it was my office/storage. The closet was many layers deep. I am not quite done. I have a few things to find good homes for and I still have the floor to sort through. I’ll finish it up on Friday. We tend to follow the public school systems schedule. It helps us stay on track and schedule activities that follow that schedule. This the first week of our two week spring break. Since we are behind in math we decided to have them do math this week. It is not a lot but it will help make sure we keep on track. So how did we fall behind? Basically I got lucky last year and made the assumption that it would work out the same this year. We use IXL for math which is great and we love it. It covers all of the prescribed learning outcomes for our province. It also covers all the other provinces and I think all the states. I know it is available in both countries just not whether it is the same or not. Last year I had Philip do whatever sections he felt like the first two terms. In the last term I looked at the PLO’s that we were missing and made a list of sections that he had to do. I knew that he had done a few sections that had resulted in higher grade PLO’s to be checked. This year we are missing quite a few. They both ended up doing a lot of math that they didn’t need to. Not a bad thing but I still have to get those boxes checked. I ended up with two meals out this week which is always nice. We don’t eat out often so it is a real treat. I somehow came home with just enough leftover steak for Stroganoff. That is one of the dishes that my wife makes. I can make it but it doesn’t turn out the same. Wednesday my wife had to work that night so we had bachelor’s fare and made meatloaf. Thursday night was a big pork roast that should last a couple of days. My wife refers to these weekly journal posts as my ‘homework’ and that she reads them so she knows what we have been doing all week.